I’m all about getting food on the table without a lot of fuss. 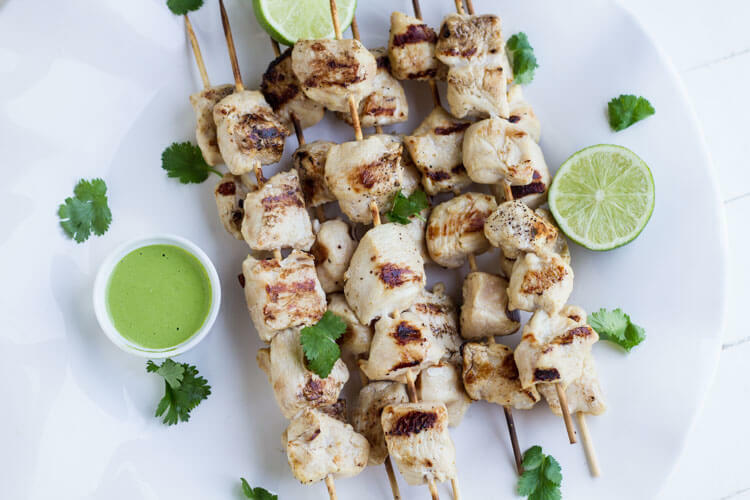 These grilled chicken kabobs make for a super quick and easy dinner any night of the week with just minutes of prep and cook time. I told you a few weeks ago how OBSESSED I am with Magic Cilantro Sauce. I literally put in on anything and everything. It’s that good! Like creamy, garlicky, cilantro good! This week has been pretty busy at the Savory Lotus household. We are getting the garden ready to be planted. Pulling weeds and clearing out the garden beds. We are also doing a bit of remodeling, a constant thing when you live in a house built in the 1930’s. Always something to fix or replace. I am so excited to be putting the final touch on my kitchen remodel- a big barn door slider made from reclaimed wood. It’s going to be the perfect rustic finish to my boho chic, Scandinavian, slightly modern style kitchen. I can’t wait to share some pictures. Anyway, life has been busy and easy dinners have been on the menu. And since it’s been pretty warm outside, I’ve been grilling on the barbecue instead of heating up the house. Chicken kabobs are my go-to when I am short on time. Simply marinate and cook. So easy. I serve them with whatever veggies we have on hand. Everyone is happy. Like I said, these chicken kabobs require very little prep and cooking. And the marinade and sauce can be made ahead of time to save time. I usually make the marinade and Magic Cilantro Sauce the night before so it’s ready to when I need it. I then place the chicken in the marinade a couple of hours before cooking. 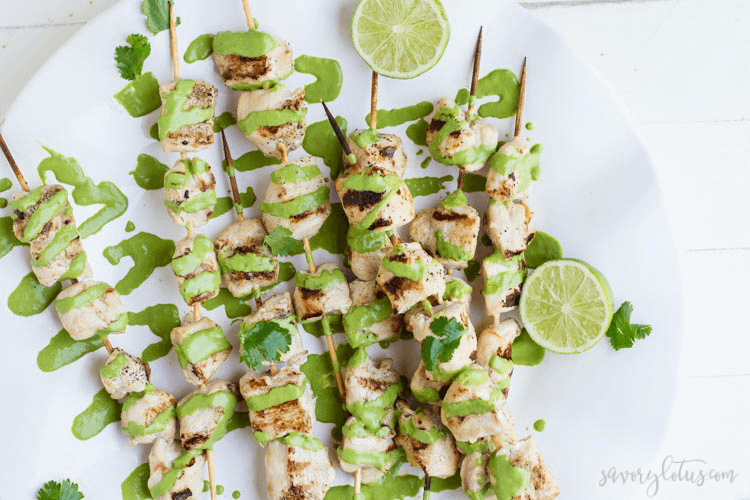 I love how flavorful and juicy these kabobs are with just a simple marinade. And then you add the Magic Cilantro Sauce, and you have a stellar meal. 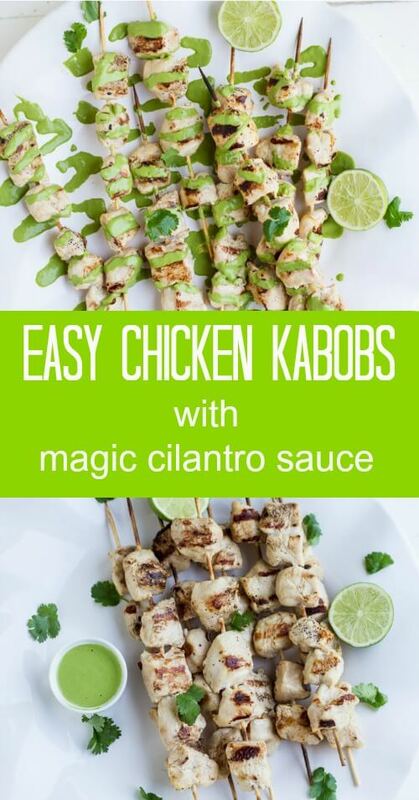 I love serving these kabobs with a big green salad and veggies. They also go well with any Mexican-style meal. Delicious food doesn’t have to be complicated. Prepare marinade and any sauces the night before. The perfect marinating time for softer meats like boneless chicken breasts is 2-4 hours (no more than 8). Marinating too long will create a mushy consistency. Use kitchen shears to chop your chicken breasts into uniform pieces. No need to get your cutting board all dirty with raw meat. Use a shallow glass bowl to marinate your chicken pieces. Plastic bags create unnecessary plastic waste and , I am not convinced that unwanted chemicals and dyes do not leach into your foods, especially if using an acidic marinade. 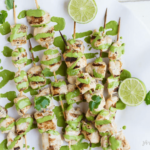 If using wooden skewers, be sure to soak in water for 20-30 minutes before using to prevent burning. TO MAKE MARINADE: Whisk together lime juice, oil, aminos, honey, garlic, cumin, and salt and pepper in a medium bowl. Cover and refrigerate until ready to use. 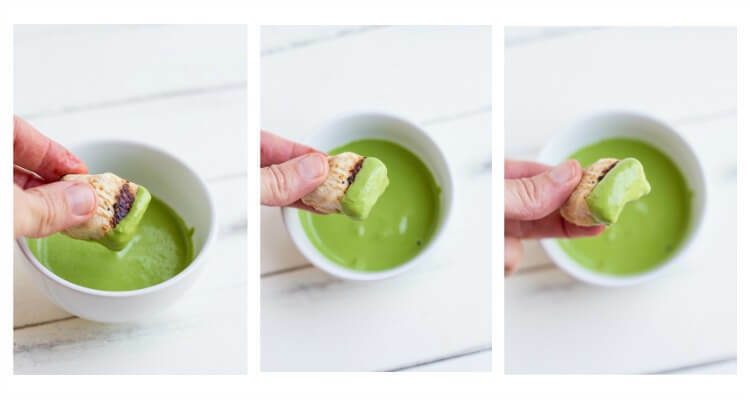 TO MAKE MAGIC CILANTRO SAUCE: Blend together cilantro, mayo, lime juice, garlic, and salt and pepper in a blender or food processor until creamy smooth. Refrigerate until ready to use. TO MAKE KABOBS: 2-4 hours before cooking (no more than 8 hours), place chicken pieces in bowl with marinade. Stir to evenly coat. Cover and place in fridge. When ready to cook, preheat grill to medium high. Remove chicken pieces from marinade and discard marinade. Thread onto skewers. Lightly oil grill grate and place skewers on grill. Cook for 8-10 minutes, turing once, until chicken is cooked through. 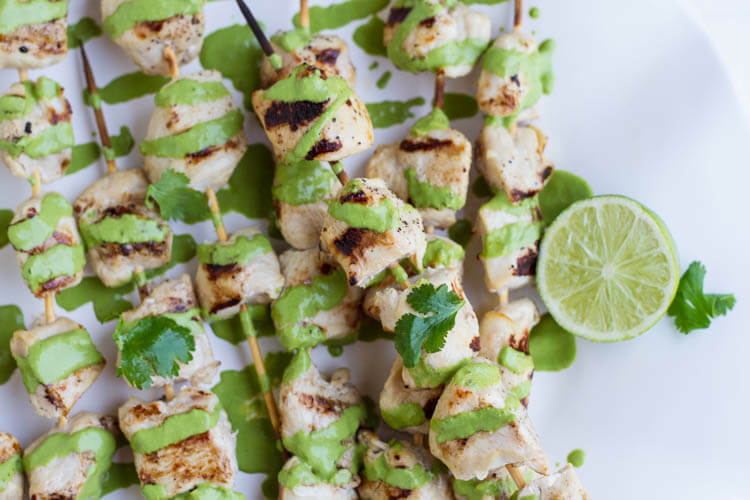 Serve immediately with Magic Cilantro Sauce. Enjoy!